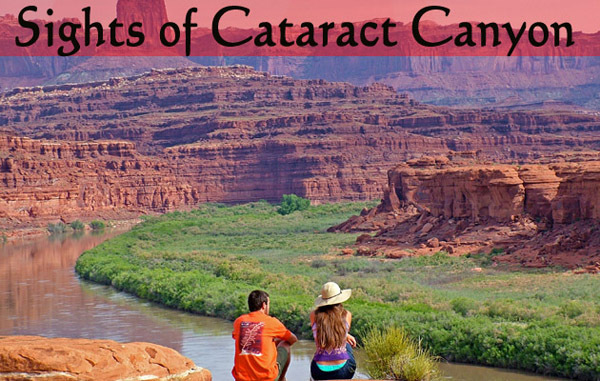 The Sights of Cataract Canyon through Canyonlands National Park is a journey into a spectacular, remote wilderness. This high quality adventure is the ideal balance of serenity, relaxation, and exhilaration. From the beginning of the trip, you will find yourself seduced by the pace of the river while absorbing beautiful scenery and enjoying the camaraderie of interesting people. 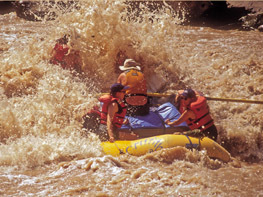 The oarboat is the traditional raft on the Colorado River. This type of raft places you 'up close and personal' with the river and its natural power. It's a pure wilderness river trip combining all the comforts needed to enjoy the outdoors. Only the quiet dipping of the oars in the water breaks the quiet of the smooth water sections. The longer trips allow for more hiking time. 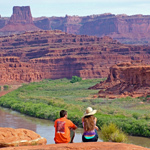 The Colorado River in Canyonlands National Park has some of the most outstanding hikes in all of Utah. This rafting trip will take you through a spectacular, remote section of wilderness in Canyonlands National Park by oarboat. This trip combines the serenity of floating through calm stretches of majestic red rock formations, incredible hikes to natural features and ancient Native American ruins, and the exhilaration of some of the most exciting whitewater in the United States. 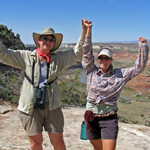 Experience one of the most beautiful parts of Canyonlands National Park at the relaxing pace of the Colorado River while enjoying the camaraderie of fun and interesting people. This world-class nature tour is breathtaking. Cataract Canyon is historically and geologically amazing; the rapids are dazzling, and the hikes are soul stirring. 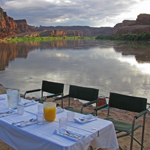 The beautiful river canyon in Canyonlands National Park is our home, and after four decades welcoming visitors here, we know how to bring all the comforts of a five-star hotel right onto this remote stretch of river.